There are many metrics and measurements when it comes to evaluating energy as we use it in our daily lives. In order to compare between different sources or end uses we often have to make conversions in our terms so that our comparisons are equitable. This may be further complicated as different countries often use different standards of measure, however, we will convert to common units. Benchmarking is a common practice in buildings to establish existing consumption rates and to identify areas that require improvement and to help prioritize improvement projects. These benchmarks can be established for a building, system within a building, or even a larger campus, facility or power source. Usually an energy or facility manager will determine energy consumption over a fixed period of time, 1 to 3 years, and compare it to similar facilities. Normalized by gross square footage of the building the EUI is usually expressed as kBtu/sf per year. The EUI of a building includes the electrical power use and heating fuel consumption for heating and hot water generation. Many facilities require different loads according to their primary use or function, including cooling and refrigeration. For the comfort of occupants electricity is needed for lighting and plug loads to meet the functioning needs of the equipment in the facility. Heating, ventilation and air conditioning (HVAC) may require electricity or another fuel such as natural gas. Hot water may be generated with electricity or a fuel. A site may also have solar PV or hot water, wind power, and daylighting programs. There are also many strategies which may be employed by building operators to reduce loads and energy consumption including controls, storage, micro-grid, purchasing offsets, etc. 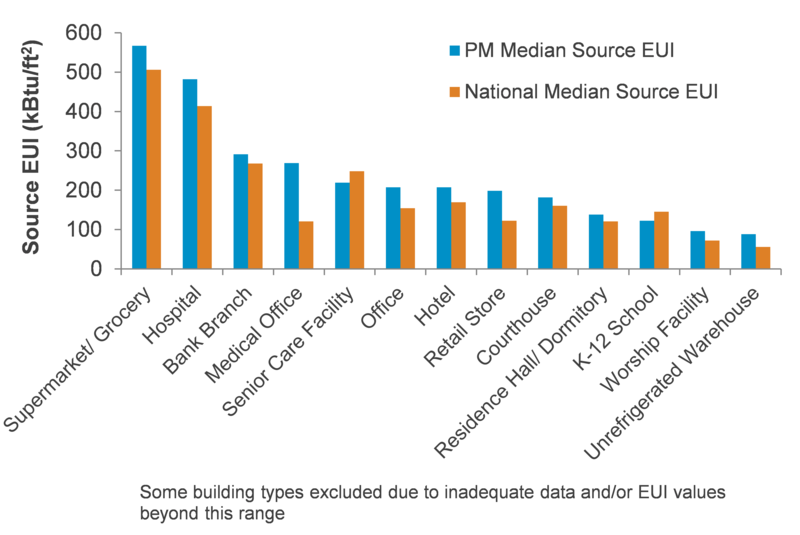 When comparing buildings, people not only talk about total energy demands, but also talk about “energy use intensity” (EUI). Energy intensiveness is simply energy demand per unit area of the building’s floorplan, usually in square meters or square feet. This allows you to compare the energy demand of buildings that are different sizes, so you can see which performs better. As we go forward into the future, it is rather unclear how current events will affect the international agreements on reducing carbon consumption. However, generally speaking, renewable energy sources are seen to becoming more economic for power production. For many facilities this means that supplementing existing grid sources for power with on-site power production is making economic sense. Future building improvements may include sub-systems, batteries and energy storage schemes, renewable sources or automated or advanced control systems to reduce reliance on grid sourced power. The energy intensity values in the tables above only consider the amount of electricity and fuel that are used on-site (“secondary” or “site” energy). They do not consider the fuel consumed to generate that heat or electricity. Many building codes and some tabulations of EUI attempt to capture the total impact of delivering energy to a building by defining the term “primary” or “source” energy which includes the fuel used to generate power on-site or at a power plant far away. When measuring energy used to provide thermal or visual comfort, site energy is the most useful measurement. But when measuring total energy usage to determine environmental impacts, the source energy is the more accurate measurement. “WASHINGTON – The U.S. Department of Energy today released the agency’s first annual analysis of how changes in America’s energy profile are affecting national employment in multiple energy sectors. By using a combination of existing energy employment data and a new survey of energy sector employers, the inaugural U.S. Energy and Employment Report (USEER) provides a broad view of the national current energy employment landscape. “[…] While much of the debate on climate change and employment has focused on renewables, another and more significant source of jobs from decarbonization has received much less attention. Substantial efficiency gains are technically feasible and economically viable in industry, housing, transportation, and services. Businesses can make a profit and households can enjoy real savings. And spending the surplus on things other than fossil energy will boost an economy’s employment. For example, the United States is a diversified economy that imports substantial amounts of equipment for renewables. A recent study carefully considered economy-wide effects of reducing emissions by 40 percent by 2030 through a mix of clean energy and energy efficiency (Pollin and others, 2014). It concluded that $200 billion a year in investment would generate a net gain of about 2.7 million jobs: 4.2 million in environmental goods and service sectors and their supply chains but 1.5 million lost in the shrinking fossil- and energy-intensive sectors. The net gain of 2.7 million jobs would reduce the unemployment rate in the 2030 U.S. labor market by about 1.5 percentage points—for example, from 6.5 percent to 5 percent. The authors consider this a conservative estimate; for example, it does not take into account the 1.2 to 1.8 million jobs likely gained from reinvested savings.